Elizabeth Joan Jennings, one of Britain's most popular poets, was famed for the imagery, logic and emotional sensitivity that characterised her work. Her work is passionate and precise, imbued with human values, religious vision and natural sympathy. Jennings was born on July 18 1926 in Boston, Lincolnshire, England, where her father was stationed as chief medical officer. She graduated from Oxford University and worked as a librarian at the Oxford City Library, which let her immerse herself in her greatest passion: poetry. Being a devout Roman Catholic, religion was an important theme in her work. Though many of her poems were inspired by the events of her life, she often said that her work should not be read as autobiographical. Jennings’s work displays a simplicity of metre and rhyme that she shares with other poets such as Philip Larkin, Kingsley Amis and Thom Gunn, a group of English poets known as The Movement. 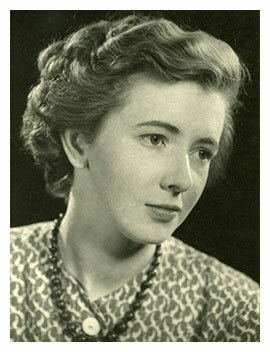 Jennings’s devotion to poetry created over twenty books during her life, with a New Collected Poems appearing in 2002. The unassuming technical craft of her poetry and its emotional restraint were praised by the poets and critics of the period. Among the many honours awarded her work are the W.H. Smith Literary Award, the Somerset Maugham Award and a CBE. Elizabeth Jennings was never married, and the centre of her world remained mainly Oxford. However, within the modest geographical limits, she lived a rich life of letters, culture and friendship. Though she regarded poetry readings an ordeal and avoided most literary readings, she was much-loved for the flowing free verse that celebrated life in its myriad forms. Up until her death, Jennings continued her literary career. She died at a care home in Bampton, Oxon on 26 October 2001. Below are listed the poems of Elizabeth Jennings. Click on a poem to access unique and well-researched analysis.